The Technology Integration Matrix (TIM) was developed to help guide the complex task of evaluating technology integration in the classroom. It provides a common vocabulary for pedagogically sound technology integration for teachers, school leaders, coaches, researchers, evaluators, and professional development facilitators. The theoretical framework of the TIM is based in constructivist learning theory and research related to teacher practice. In contrast to other models for technology integration, the TIM is designed to evaluate a lesson, as opposed to rating a teacher or judging a discrete task. The original TIM was developed in 2003-2006 with funding from the Enhancing Education Through Technology (EETT) program under Title II, Part D No Child Left Behind Act of 2001 (the original version has been archived here). The second version of the TIM (2010-2011) was created with funding from the Elementary and Secondary Education Act, Title II-D of NCLB and the American Recovery and Reinvestment Act (ARRA). In this version, the matrix descriptors were revised and expanded, and video examples were added for Math, Science, Language Arts, and Social Studies. As part of the development of the original and the second versions of the TIM, educator focus groups, field tests, and usability studies were conducted. FCIT recently published a chapter that provides in-depth information related to the theoretical foundations of the TIM, along with complete descriptions of the elements. 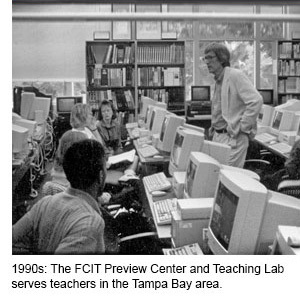 Established in 1982, the Florida Center for Instructional Technology (FCIT) at the University of South Florida (USF) has been a leader in working with educators to integrate technology into the curriculum for over 30 years. In the early days, FCIT provided online tutorials as well as face-to-face training at our Tampa location. At that time, our professional development focused on finding appropriate programs for use in school computer labs and how to use the newly-established Florida Information Resource Network (FIRN). When not reserved for training sessions, our lab functioned as an active preview center for teachers in the Tampa Bay region. In those days before widespread connectivity, FCIT relied on print publications and diskettes for much of our professional development outreach. Major grants from IBM in the 1980s helped familiarize schools with microcomputers and served as a catalyst for the creation of the Instructional Technology graduate programs at USF. In the 1990s, support from Apple and from Microsoft allowed us to offer additional professional development opportunities for teachers. By the turn of the century, FCIT was conducting over 100 full-day workshops every year on a variety of technology topics at our Tampa location and at other locations around the state on demand. A team of Educational Technology Integrators (ETIs) was funded by the Florida Department of Education to provide ongoing training and support for all districts across the state. The Center also began our online collections of digital content (maps, photos, clipart, audiobooks, etc.) to support classroom technology integration activities. Currently, we serve up between two and three million digital assets from these collections each school day. 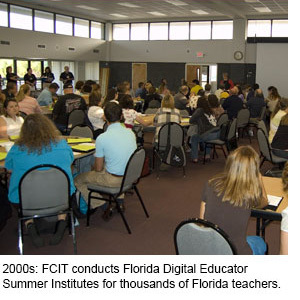 In the 2000’s, we expanded our training offerings to include Florida Digital Educator four-day institutes that were conducted in all regions of Florida each year. Along with the Master Digital Educator program, which was also available for graduate credit at USF, these statewide trainings contributed to the development of many of today’s technology leaders in Florida. By 2005, our experiences working with teachers to more effectively integrate technology into their classrooms led to the development of the Technology Integration Matrix, a practical guide for teachers striving to take their teaching practices to the next level. The original Technology Integration Matrix was developed with funding from the Enhancing Education Through Technology (EETT) program under Title II-D of NCLB. The second version of the Technology Integration Matrix expanded matrix descriptors and added video examples for Math, Science, Language Arts, and Social Studies. It was developed with funding from the Elementary and Secondary Education Act, Title II, Part D No Child Left Behind Act of 2001 and the American Recovery and Reinvestment Act. This website update includes revised videos and additional resources. It was developed with funding from the Verizon Foundation and fees generated through licensing of the TIM Tools. The TIM Evaluation Tools were initially developed with University of South Florida research initiative funds. Ongoing development of the Evaluation Tools is funded by TIM Tools licensing fees.